The pieces gathered here are a combination of experimental works from my private collection and pieces produced for jewelry-making competitions. These pieces represent ventures into new techniques and attempts to push the boundaries of my construction skills. Some items from this collection are available for sale in my Etsy store. Designed for the 2014 Toho Challenge, currently on exhibit at Toho Beads headquarters in Hiroshima, Japan. I designed this piece to commemorate writing the first chapter of my dissertation. Awarded First Premium in the beaded jewelry category at the 2013 Minnesota State Fair. Winner of both the public and team voting in the Etsy Beadweavers Team August 2013 Challenge, "Sea Adventures." This lavish piece won a silver medal in the 2011 Swarovski Elements competition from Fire Mountain Gems. The piece incorporates hundreds of crystals with a thick-cut druzy agate focal stone. 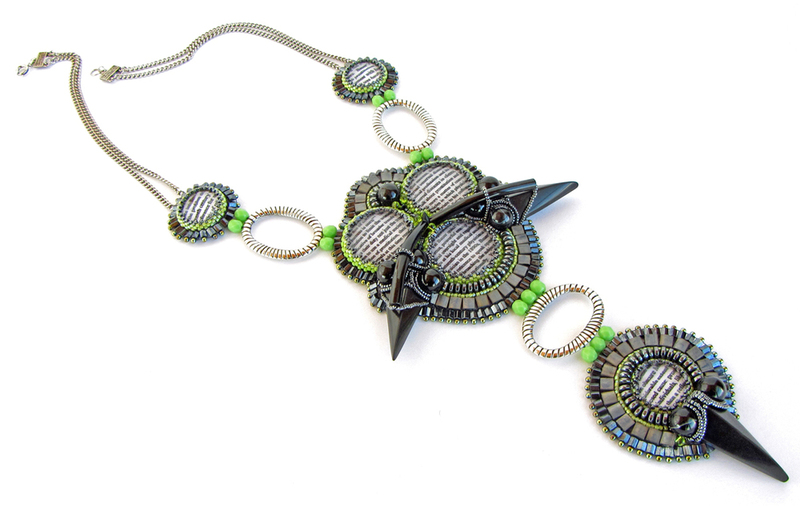 I designed this piece for Beadwork Magazine's Beaded-Bead competition. The intricately beaded rope necklace features my interpretation of the five beaded beads patterns for the competition as well as beaded beads of my own design.